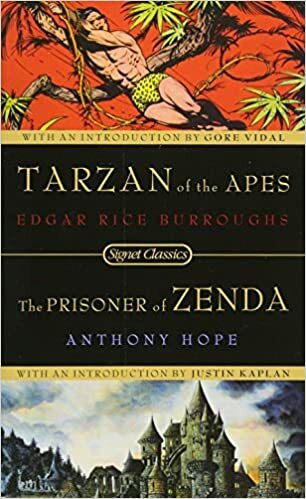 This month’s read over at the Dewey Decimators was Tarzan of the Apes so I dug out this book that I’ve had hanging around for a while which contains both Tarzan and The Prisoner of Zenda. It’s kind of an odd pairing with the stories having little in common other than being escapist adventure written in English within 20 years of each other. I’m going to go ahead and do a mini-review of each here. I read a fair amount of pulp, but tend to avoid the Noble Savage (or Great White Hunter) variety, and this classic tale of the man raised by apes reminded me why. It had everything that I find grating in the genre: black people are canon fodder (except for the servant who was a racist caricature played for laughs), women are helpless ninnies (Jane would rather shoot herself than try to kill the lion climbing through the window), the action is stupidly over the top (putting a lion in a full-nelson hold…really? ), there are more than the usual number of convenient coincidences even for a pulp, and it ends on a cliffhanger. I just can’t suspend my disbelief and ignore the “product of its era” cringey bits quite as much as this book requires. Maybe if I’d read it or watched Tarzan movies/TV as a kid there would be a nostalgia factor that would help me enjoy it more, but it just didn’t work for me. This swashbuckling adventure tale that launched a sub-genre (the Ruritanian Romance) is good cheesy fun. An English gentleman visiting the small Balkan nation of Ruritania has to step up and pretend to be the king (who conveniently looks just like him thanks to some scandalous shared ancestry) in order to keep the throne from Black Michael, the king’s scheming half-brother who has him secretly imprisoned in the Castle of Zenda. To quote The Princess Bride, it has “Fencing, fighting, torture, revenge, giants, monsters, chases, escapes, true love…” Well, maybe no giants or monsters, but you get the idea. It’s good hokey fun that explores the idea of nobility (and even has some surprisingly moving moments). I felt like Zenda was nothing but a mashup of Prince and the Pauper and the Man in the Iron Mask. And both were written before (I had to check to be sure, but it came after by a couple of years). I’ve never read the Tarzan stuff because I was done with ERB and his pulp after 5 or 6 of his Barsoom books. What I actually find inconceivable (hehe) is the pairing of these stories. Wonder what the thought process behind it was? Oh yes, Zenda is most definitely derivative as all get out. As far as the pairing, it would’ve made a lot more sense to pair Tarzan with Haggard’s Quartermaine or Howard’s Conan, and Zenda would have paired nicely with Zorro. I would say they did it to show variety within pulp/adventure classics, but there was no hint of that in the introductions.